Super Smash Bros. Melee, known in Japan as Great Melee Smash Brothers Deluxe (大乱闘スマッシュブラザーズDX, Dairantō Sumasshu Burazāzu Derakkusu), often abbreviated as SSBM or simply as Melee, is a crossover fighting game released for the Nintendo GameCube shortly after its launch in 2001. Like its predecessor, Super Smash Bros. Melee differs from traditional fighting games in that inflicting the most damage does not guarantee victory. Instead, opposing players must inflict damage to add to the opponents percentage, to make them lighter, then force their opponents beyond the boundaries of the stage. Unlike other games of the same genre, in which moves are entered by button-input combinations, most moves in Super Smash Bros. Melee can be accessed via one-button presses and a joystick direction. In addition to highly refining the gameplay of Super Smash Bros., Melee also sports additional stages and characters, and an expanded single player mode, called "Adventure Mode". The game also introduced many of the staples of its sequel, Super Smash Bros. Brawl. 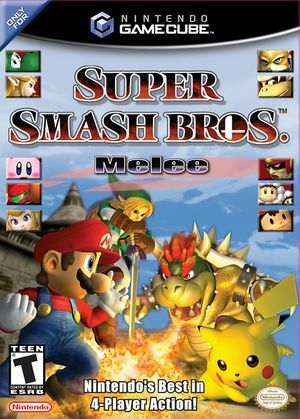 Melee received universal acclaim from critics, and went on to become the best selling GameCube game of all time. 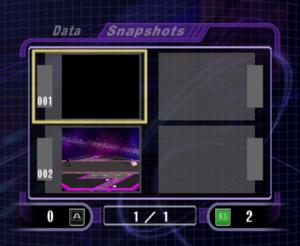 Saving a screenshot in Camera Mode of Special Melee will just be a black image. You can fix this by turning off EFB Copies to Texture Only. The NTSC version of this game has 3 different revisions. You can check the revision of your ISO by going into Game Properties. For netplay to work, each player must not only be playing the same game, but have the same revision of said game. However, Melee was sold in many different revisions, and this may block some players from participating in netplay. Your netplay ISO can be patched to other revisions to work around this issue. For details and instructions, see the Smashboards post on the subject. There have been many Melee texture packs over the years, so don't stop at the one linked above. The graph below charts the compatibility with Super Smash Bros. Melee since Dolphin's 2.0 release, listing revisions only where a compatibility change occurred. 3.0-415 Windows 7 AMD Phenom II X4 955 @ 3.2GHz NVIDIA GeForce GTX 560 Ti Solid. Odd sound glitch and slowdown at beginning of the match. 3.5-336 Windows 7 Intel Core i7-3770K NVIDIA GeForce GTX 680 Full 60FPS everywhere with no audio bugs using LLE. Using "speed up disc transfer rate" makes all music play for 2-3 seconds and stop, but the game continues to run fine. Using any AR codes causes the game to crash after the beginning cutscene and before the "press start" screen. 3.5-1699 Windows 8 Intel Core i3-3120M Intel HD Graphics 4000 A consistent 60FPS was found during playtesting. The FPS may drop to 50-55 when playing on large stages or with multiple players. Tested on 1x Native Resolution. 4.0 Windows 8 Intel Core i7-2630QM @ 2GHz AMD Radeon HD 6600M Runs at 100% speed highest I've tested on was 2x native resolution on Direct3D11. Kept a stead frame rate with the exception of loading the levels. 4.0 Windows 8 Intel Core i7-2630QM @ 2GHz AMD Radeon HD 6700M Runs at 100% speed highest I've tested on was 2x native resolution on Direct3D11. Kept a stead frame rate with the exception of loading the levels. 4.0-1818 Windows 7 AMD FX-6300 @ 3.5GHz NVIDIA GeForce GTX 660 Some drops here and there, especially on Fountain of Dreams. 1x Native Res. Will overclock and post more info. Runs like a dream. Minor slowdown in menus, no issues with gameplay. This page was last edited on 25 July 2018, at 03:25.